As tractor functions become more mechanised and automated, can one control terminal do it all and replace banks of screens and levers? Jane Carley investigates. New Holland’s Intelliview IV terminal offers a common platform for tractors from the T6 series upwards, combines and forage harvesters. 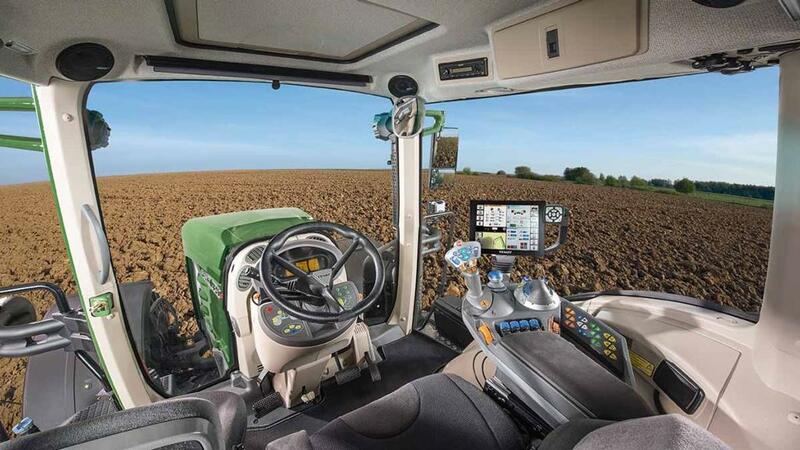 Intelliview complies with the latest IsoBus Class III protocol, which means it can operate implements rather than using a separate terminal and it can allow the tractor to be controlled by them. “IsoBus implements can control forward speed, engine speed, hydraulic flow and even stop and start the tractor,” says Mr Holland. While a single terminal cuts cab clutter and makes operation of implements simpler, this can be at the expense of a busy screen or constant scrolling or flicking to get the information required. Data transfer is via a USB stick to New Holland desktop software, compatible with Gatekeeper. Using the PLM Connect telemetry package, files can be transferred wirelessly to the farm office, downloading yield data from a harvester for example or uploading application maps. “Basic functions of the terminal are in the grasp of every farmer. We then offer field and telephone support to get the best out the system for their particular application,” says Mr Holland. 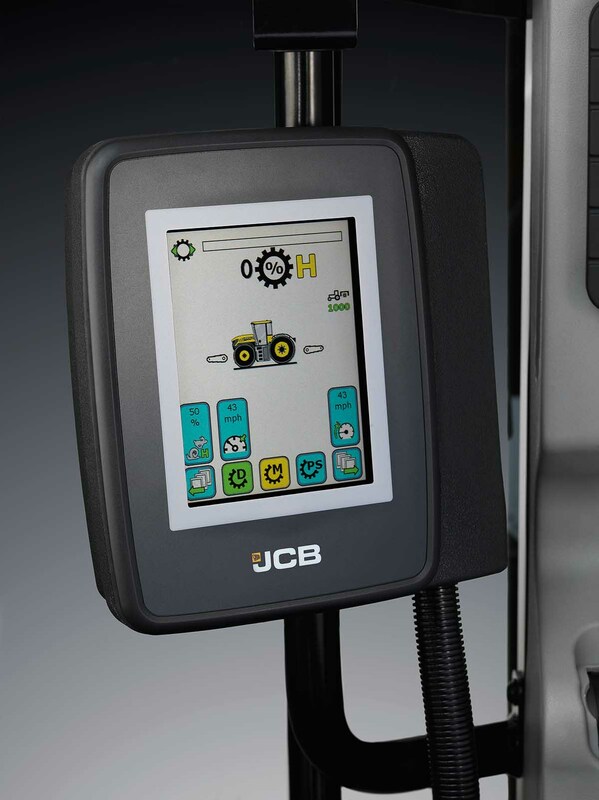 The touch-screen terminal in JCB Fastrac tractors is designed to handle setting up and adjustment of machine functions and a key feature is the use of easily identifiable icons to access functions and easy navigation to the various sections. Large icons are designed to be easier to finger-tap on the move and up to five sequences, each with up to 15 steps in the Headland Turn Assist Section, can be created and saved to minimise control workload at the end of each run across a field. The display can also be customised and specific functions assigned to joystick buttons according to the operator’s preferences. GPS guidance is available via a third-party display, such as a Trimble unit, and IsoBus implement control via a compliant display from Ag-Leader, John Deere, Topcon and Trimble. Other IsoBus displays may need additional connectors. The latest version of the Fastrac 8000 Series tractor has a new hydrostatic steering system to enable it to work to higher levels of guidance accuracy. Fastracs come with JCB’s LiveLink telematics system as standard, which provides location and operating information, as well as proactive service scheduling and remote fault finding in partnership with JCB dealers and JCB’s own technical support team. Case IH’s Pro 700 terminal offers monitoring and control of all functions from tractor dashboard instrumentation and spool valves to guidance and operation of IsoBus implements. Records can be transferred to desktop software and prescription maps uploaded either using a memory stick or FileTransfer via the cloud. Mr MacDonald adds while implement compatibility is improving all the time, there are still glitches and the best way to avoid this is to check the Agricultural Industry Electronics Foundation global standard via its app. He adds while there is interest in tablet control, simply due to the user-friendly nature of an iOS screen, drawbacks include the complication of troubleshooting an app. Fendt’s Variterminal offers Integrated Guidance mapping and acts as an ISO Universal terminal with section control built into the terminal relay for use with any suitable IsoBus implement. Variable Rate Control is also integrated into the terminal, with the ability to handle multiple products simultaneously. Secure wireless data transfer between systems such as Gatekeeper and the tractor uses the mobile phone network to send tasks to the tractor where they are stored until selected. ‘As applied’ maps are then sent back for paperless record-keeping. Advanced headland functionality allows a complete headland sequence to be automatically activated. Fendt suggests compatibility is rarely an issue, with the most common cause being either the tractor or the implement has outdated software on it, which is usually easily rectified. 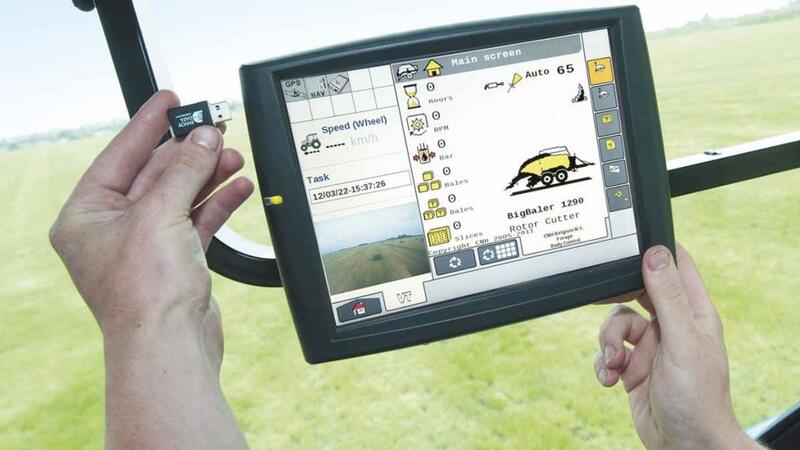 The Claas S10 is an implement terminal, but can also be used for GPS steering and to display up to four camera images. These include TC Geo, which offers GPS positioning data and variable rate and yield mapping capability. TC SC adds section control. Mr Miller adds an increasing number of Claas customers are using the S10 as a single control terminal and reducing the number of separate implement terminals. 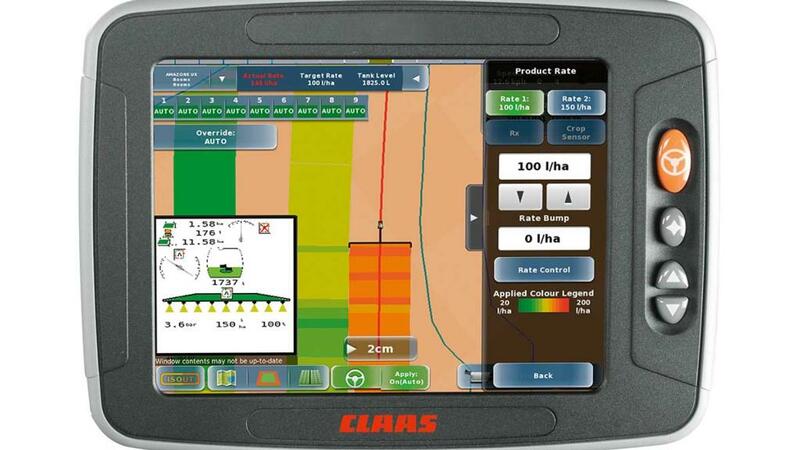 Claas takes a different approach to reducing screen clutter. 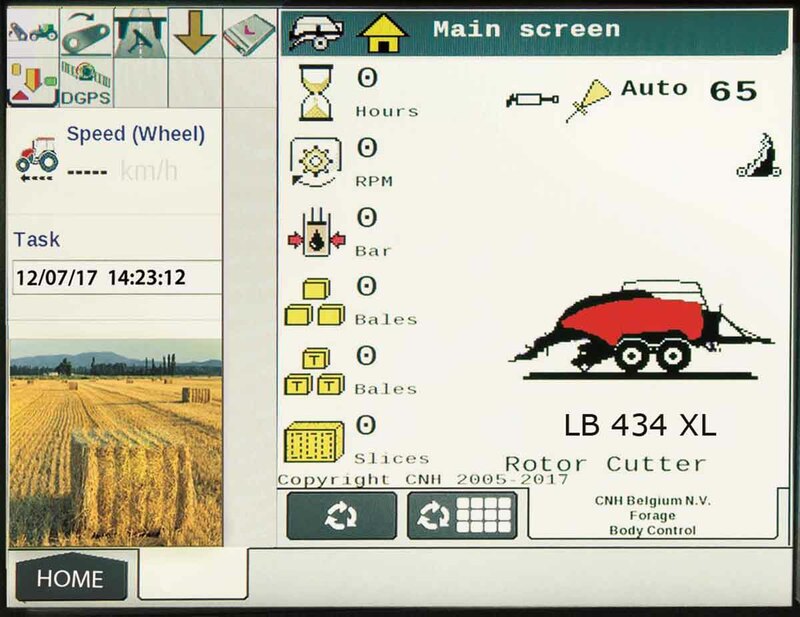 All functions for implement control to steering and tractor data are ‘layered’ on one main touch-screen, the icons becoming opaque to highlight them when tapped. John Deere has its latest GreenStar 4640 display out on test with customers, destined to be a long-term replacement for its established 2630 screen. A universal terminal suitable for moving between tractors, sprayers and harvesters, the 4640 is also complemented by the company’s 4600 integrated display, built into the armrest. All versions handle precision farming as well as machine functions and can also act as an IsoBus implement terminal. He adds John Deere displays allow implement control to be diverted to the main screen, making it possible to do away with separate terminals, but he now sees a move away from this. 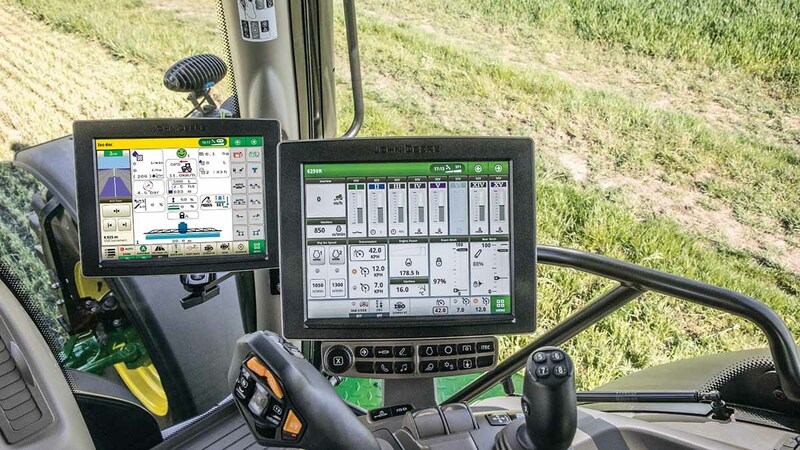 John Deere’s solution is to offer a dual display similar to using a laptop and larger monitor in the office. He says wireless data transfer has reduced the operator effort needed to send information between the tractor and the farm office and has been widely adopted. Remoteness of the field is not an issue, he says. 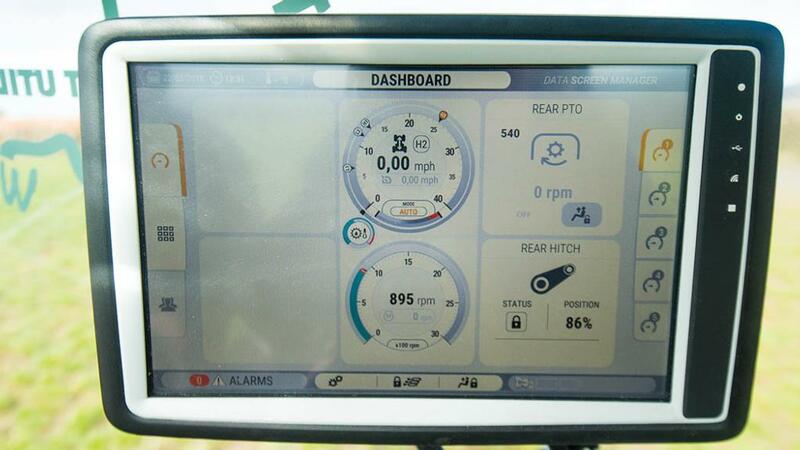 A number of new and upgraded features for McCormick’s Data Screen Manager (DSM) display give the driver access to numerous tractor set-up and operations functions and can accommodate a remote camera feed. When the IsoBus communications option is installed on McCormick X7 and X8 tractors, the DSM is turned into an AEF-compliant Universal Terminal. McCormick manufacturer Argo Tractors is introducing the electronics infrastructure into more tractors in the McCormick range, including the Tier 4 Final 111-140hp X6.4 and new 110-126hp X6.05 models becoming available later this year. With the latest software upgrades, a number of the DSM’s non-IsoBus functions have been refined and enhanced, including a greater range of display brightness settings, individual set-up and information records for different drivers, and the facility to edit recorded headland management sequences. Added versatility in electric spool valve set-up comes with the ability to allocate valves to the paddle switches, loader mini-joystick and switches on the transmission control handle, called EasyPilot on VT-Drive models, for a set-up which individual operators find most convenient or intuitive. The Precision Steering Management option comprises an integrated system linked to a separate Topcon display.